Well, whether I like it or not, my birthday officially is a week away! (Check out this post for my birthday insecurities). Since we’re going to be on vacation all next week, I didn’t ask for too much this year. I mean, what can top a birthday vacation, right?! 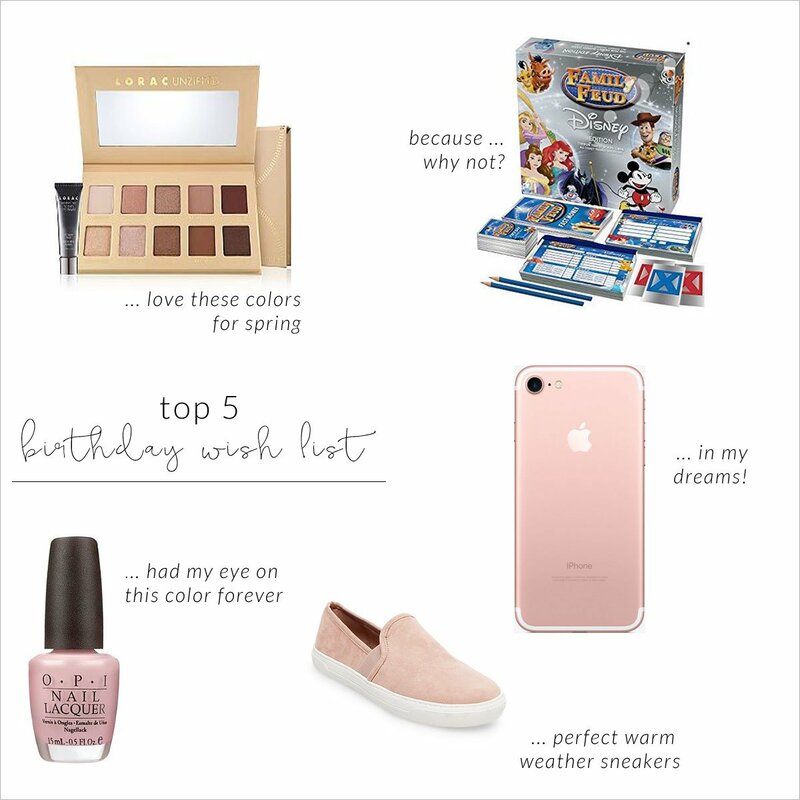 Nonetheless, it’s always fun to put together a wish list so here’s my top 5 birthday wish list that I hope to receive or purchase for myself in the coming months! Beauty | I think I have an eye shadow palette addiction. They are my weakness! LORAC palettes are still my favorite, and the original Unzipped palette is at the top of my list. The selection of shadows seems like you can create a variety of looks! OPI’s Mod About You polish also has been on my radar for a long time, so that would be a nice little treat. Board Game | Kind of funny how this is the only non-blush thing in this wish list. This is a super random gift idea, but Ryan and I love to have game night so we’re slowly trying to build our board game collection. We love Disney. We love Family Feud. So, this game seems like a no-brainer. Sneakers | I never thought the day would come when I’d be a sneaker gal, but that day has arrived. Sneakers are my jam lately, and this blush pair from the dv line at Target is perfection. How pretty would these be with a pair of white skinnies? The neutral color makes the style options endless. New iPhone | Ha! In my dreams! I know this is totally not going to happen, but that’s why this is a wish list. I’m still rocking the iPhone 6, but the battery life seems to die a little more every day. Depending on how active I am on my phone, I have to charge it at least twice, if not three times, daily! Not to mention the dreaded 16GB storage issue … ugh. It’s kind of a pain, but I’m trying to stick it out until August when we’re due for our upgrades. In the meantime, Ryan is keeping an eye out for any stellar deals where we could get a good trade-in deal so I could get a new phone sooner. Maybe I’ll get lucky! Do you find birthdays harder to celebrate as you get older? I LOVE that OPI color! It’s perfect for all seasons! I really need to pick it up for myself! I know everyone loves it! New board games are always my favorite and Disney Family Feud sounds like so much fun. The LORAC palette is so pretty and you can’t go wrong with that nail color! Everyone raves about that nail color, I can’t believe I have yet to try it. And, yes to board games! That’s what we’re all about for entertainment these days. ugh my iphone 6 is doing the same thing!! i am eligible for an upgrade but it will still cost money and i’m not sure i’m ready to enter another contract/payment you know? so freaking annoying. I know – the damn phone companies know how to get you these days! All of the products are so chic! Thank you for your inspiration! I just ordered those shoes literally a few minutes ago! They look so cute! Mod About You is one of my all time faves! 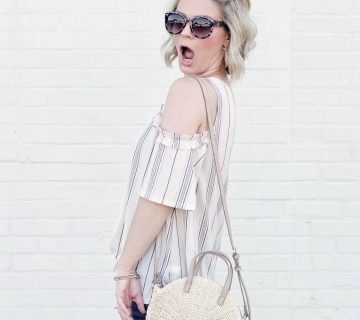 And love those shoes – Target is killing it right now! Target has so many shoes right now that I want, they are killing it! Happy almost birthday to you, too! 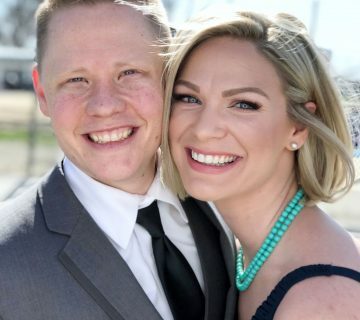 Yay for 30! Birthday/Anniversary vacations are my FAVORITE way to celebrate! I’m sure you’ll have a great time! I am excited to do the same! I’m a huge fan of board games too, and I had no idea that there was a Family Feud board game, let alone that there’s a Disney version! I need to check it out too! Right?! I don’t even remember where I saw it advertised – TV maybe – but it’s been in the back of my mind for months. That is a pretty palette! I never thought I’d be a sneaker girl either, but I love my slip on pair so much! They are just so comfortable and easy, especially for a mommy like you! Get the nail polish and the shoes! Happy birthday! That’s what I’m hoping to do! Great picks! Love those sneakers and happy birthday! Thanks, girl! Aren’t they so pretty? Definitely need to pick those up. I know it gets harder to celebrate birthdays as we get older, but it’s the perfect time to treat yourself! Hopefully the “birthday fairy” is working on your wish list! I’m sure the birthday fairy is working away like she always does – although, I’d be perfectly happy with just my funfetti cake! I kind of love this birthday wish list! That game looks like so much fun- definitely something I’d love to play! And yes to the iphone 7! My battery keeps seeming to die faster and faster too. I love these picks:) I hope you are enjoying the build up to your birthday! Thanks, girl! I felt so silly sharing this, but hey – it’s my wish list, right? Ugh, the phone battery issue is real. I have two external batteries all ready to go for next week when we’re away. I’m having the same battery issues with the 6! So annoying how fast it dies! That eyeshadow palette is so pretty! I’m glad it’s not just me, it barely lasts through the day anymore! I really hope I get that palette, it looks gorgeous.